All of us have to start somewhere. 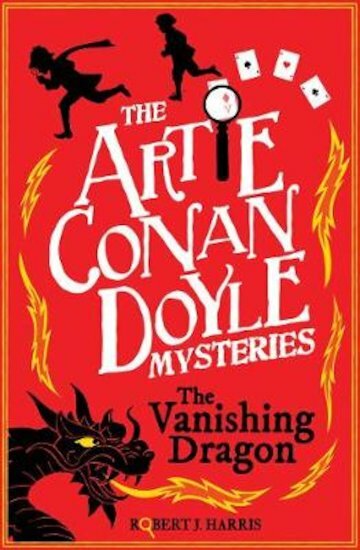 That goes for every kid – including Artie, the imaginative boy who’ll one day create fictional hero Sherlock Holmes. Right now, Artie still has no idea that he’ll grow up to become a writer. He’s just a Scottish schoolkid with a head full of dreams – oh, and an actual mystery to solve! A series of suspicious accidents have befallen a world-famous magician, the Great Wizard of the North. An enemy wants to sabotage his dazzling new show. And when a huge mechanical dragon vanishes, everyone is baffled. The theft seems to defy possibility! Can Artie figure out the thief’s tricks, unmask the villain, stay out of danger – and get some cool ideas for his future Sherlock Holmes books?